Freestanding - Bathroom Vanities There are many different types of cabinets but it can be simplified down to freestanding or floating vanity types. There are pros and cons of each but it comes down to preference which one you prefer. So Which Suits your Style? Freestanding vanities are a lot easier to install. These are cabinets that sit flush to the surface of your bathroom floor. The only thing you need to worry about is measuring the size of your bathroom to make sure it fits. Freestanding vanities are versatile, convenient and come in different shapes and sizes. They are the most common types of vanities and come in many selections including traditional, modern and transitional. Floating vanities are a little bit fancier. 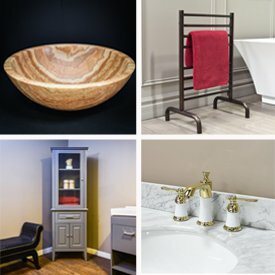 These types of vanities require wall-mounts to install into your bathroom wall. Depending on the size of the vanity, you will probably need assistance from a professional to ensure that it is secure and leveled. Floating vanities are a beautiful and aesthetically pleasing addition to any modern theme bathroom. At Luxury Living Direct, we have affordable freestanding and floating bathroom vanities that will last a lifetime. Find different fixtures and cabinets built from high quality woods and finishes. Check out the sales and clearance for the current savings and promotions, all with free shipping. Need to order 2 or more vanities? Not a problem. Call our customer service representatives at (800) 574-3022 to get a special multiple vanity discount!